For this blog post we want to continue to look at who we are, and comparing that with our favorite brands. Our goal is to see if there are certain segments among us that favor certain brands. Then we can see how those opinions change over time. 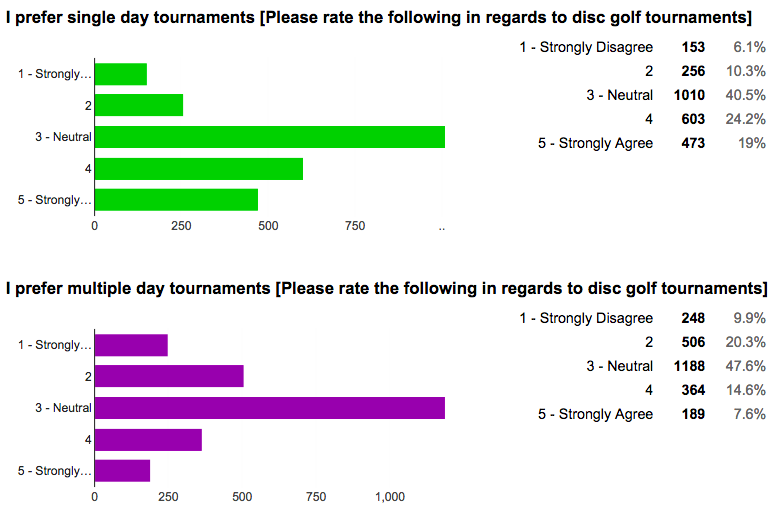 It’s nice to have disc golfers from all over the world respond to the survey. While most of us live in the U.S., the percentage of us that live outside the country increased a tiny bit to 9%. With Major tournaments, some of the top players, and a few manufacturers in other countries, ours is truly a world sport. That is great news to the 78% of us who want the sport to become mainstream, but not so good for the 4% who don’t (18% have no preference). 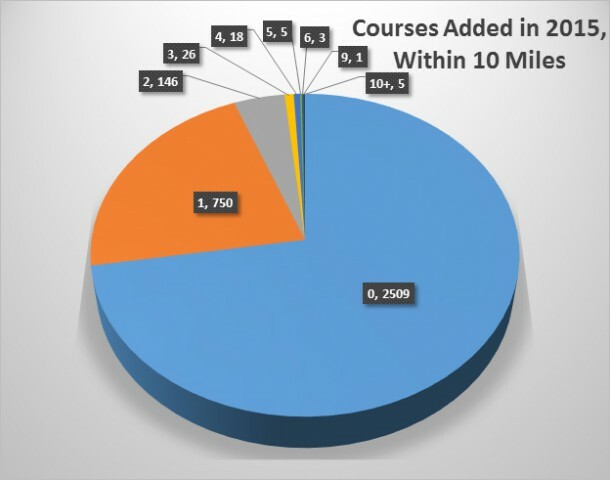 As the sport grows, it will mean more courses, clubs, tournaments, and products. 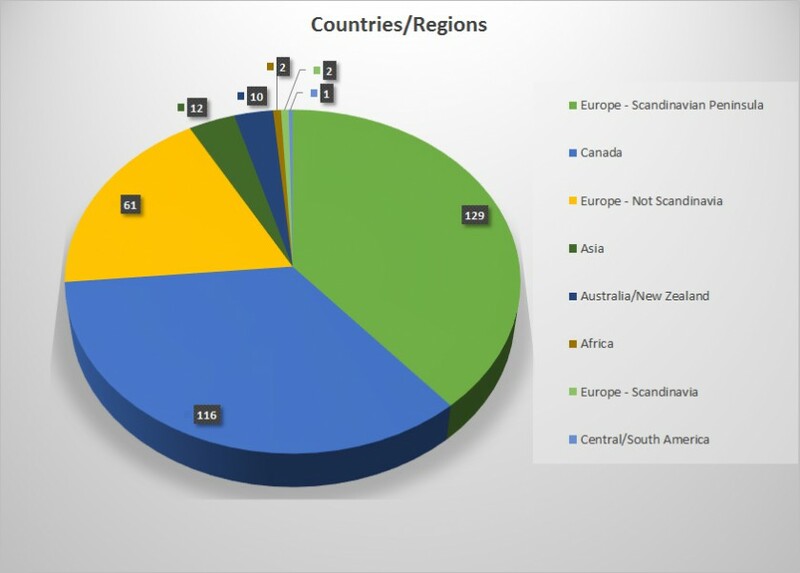 Toward that end, we are encouraged by survey participation around the world. 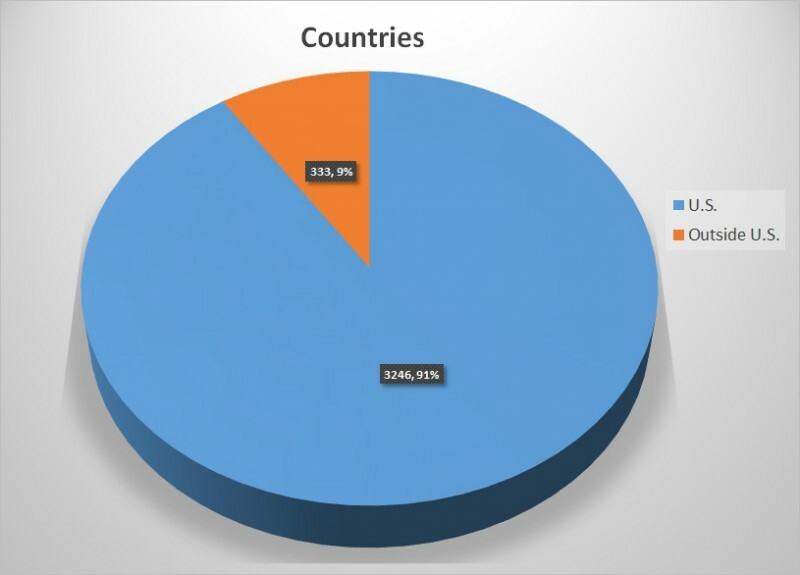 With that in mind, we will begin by looking at graphs from survey results that show where in the world we are from. 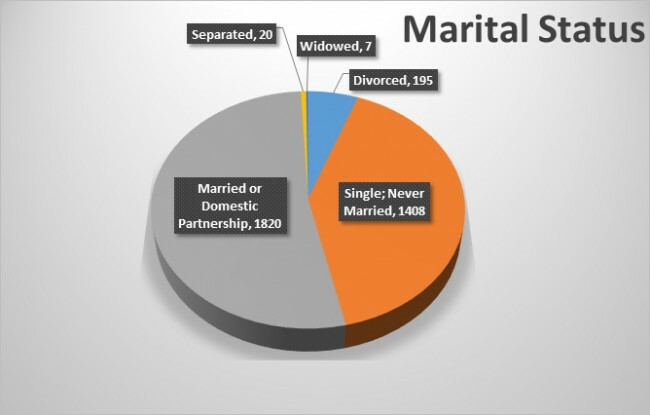 Past surveys have shown that a majority of us are male and around 30 years old. This year was no different. 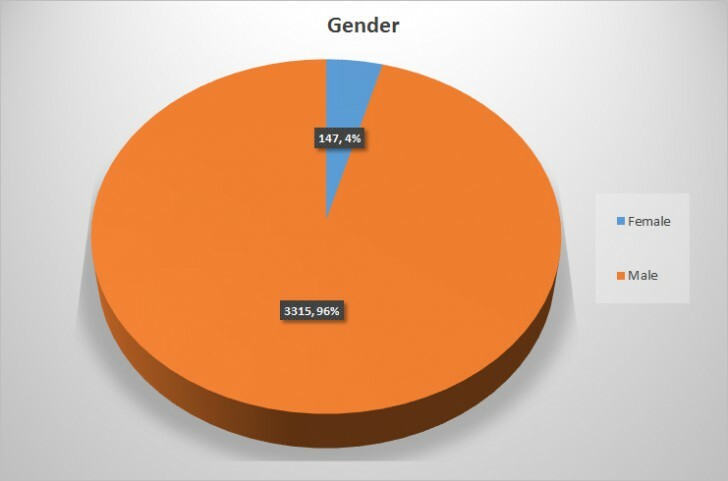 The percentage of female respondents fell slightly, with 4% of disc golfers filling out the survey being female, versus 6% last year. In some areas of the country, such as college towns, the average age of disc golfers will vary slightly from the rest of the country. The club I belong to fits that description. 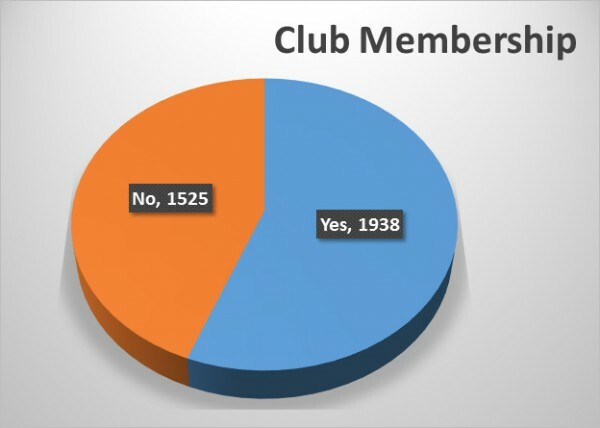 However, when I look at the clubs outside of my immediate area, their member’s ages align better with survey results. According to the survey, the average age of all disc golfers falls in the 30-35 year range. Same with last year. Perhaps at that age people are more established in their careers and feel like they have more time to play disc golf. Most of the time families have been started by then and are either getting to an age where they can join a parent on the course, or are at least more independent, allowing the disc golfer more opportunity to play. Whatever the reason, that age group continues to lead the survey. It will be interesting to see how that group ages and if they keep playing in large numbers. 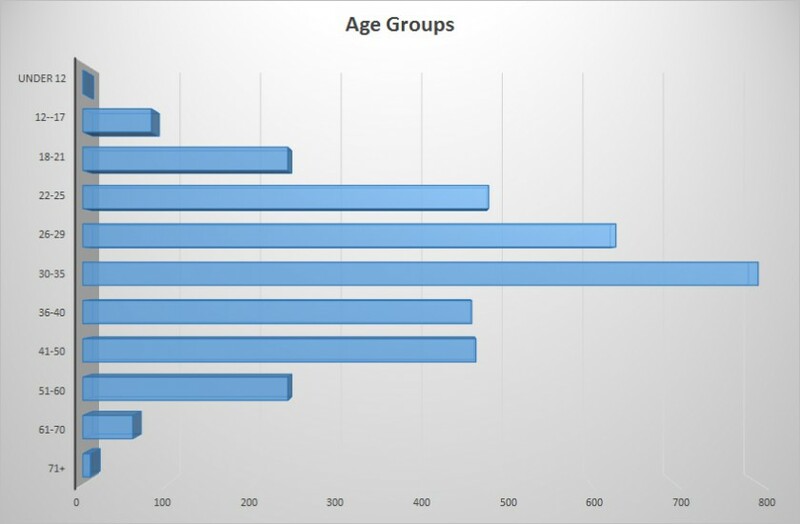 With cries of ’60 is the new 40’, maybe we will see current members of that age group continue to play, and older groups have the largest number of members. I hope so. I also hope the younger age groups balloon. It is great to see such talent coming from young golfers. Think about Eagle McMahon, or last year’s Amateur World Championships. Not only is it impressive to watch such talented young people, it will help our sport continue to grow. As was mentioned in the opening paragraph, in addition to finding out more about who we are, another goal of this blog was to break down the demographics and find out what groups favored which brands. Our hope was that we could find some interesting data, such as finding certain groups (age, experience, geographic location) that favored certain brands. Let’s just say that the results were underwhelming. Not that I have a problem with nearly every state, region, age, gender, and experience level choosing Innova as their favorite brand. It just becomes so redundant to write about. So, let’s just look at the few locations that didn’t choose Innova as their favorite. (Or tied with them). And there you have it. With less than half of all respondents choosing Innova as their favorite brand, we hoped there would be more groups that would favor another brand. While that aspect of the blog didn’t turn out like we thought, at least we can learn about us as a group along the way. For the next blog we will continue to find out more about us, such as education, occupation, etc., and about our disc golf habits. 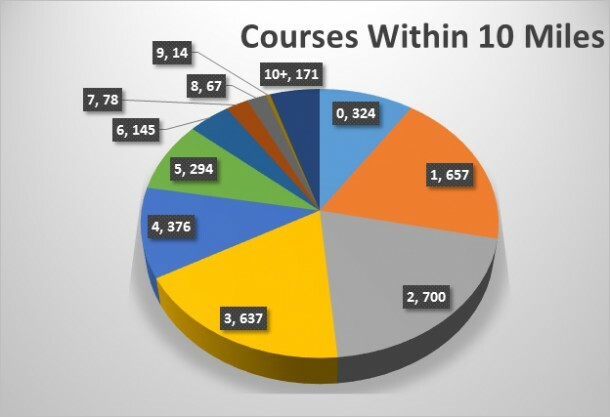 The results are in, and once again this series of blogs will examine the numbers, the changes, and the interesting aspects of our opinions about disc golf. We sincerely appreciate everyone who took the time to share a little bit about yourself so that we can get a better picture of the disc golf community. We will begin by looking at the brands we like and the changes from the last survey. With the certainty of Paul McBeth sinking a 10-meter putt, Innova dominated the category of ‘Favorite Brand’ again this year. 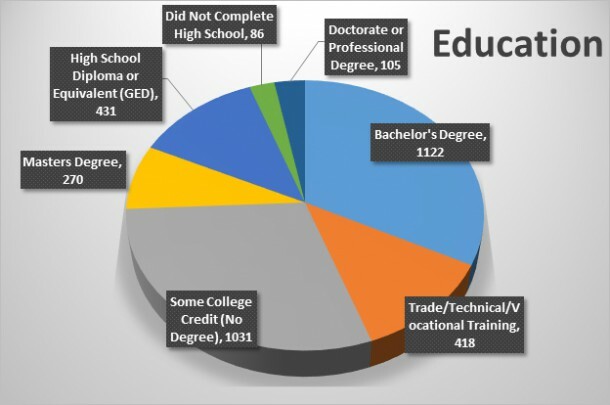 Last year they not only led the category, they also had an increase in percentage of respondents from the previous year. 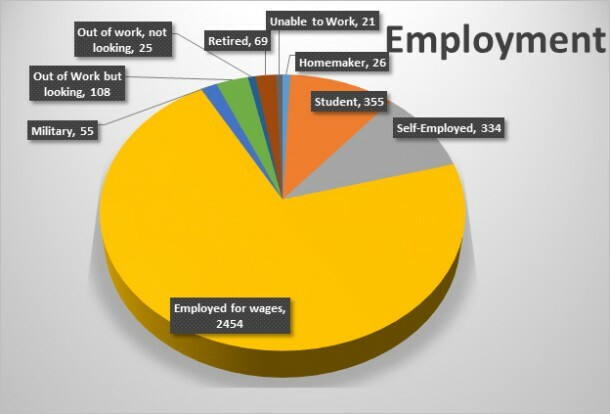 This year’s survey showed a little different picture. The undisputed champion (pardon the pun) of the disc golf world slipped a little bit, dropping from 48% to 43%. But, that’s still higher than the 2013 survey (38%). 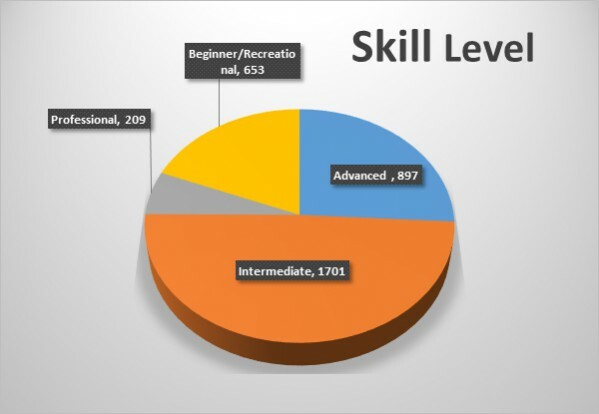 The next few positions experienced a few changes, but not big numbers. 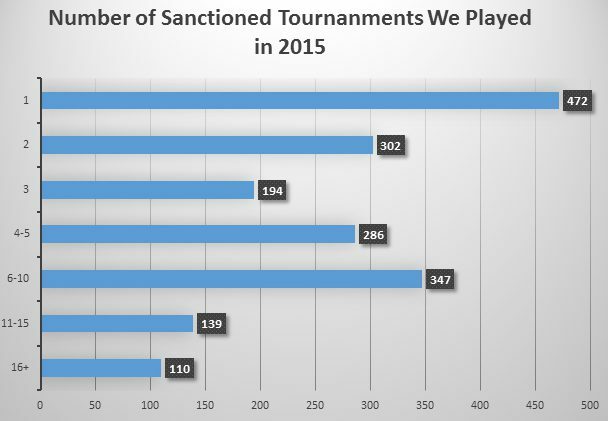 Discraft dropped from second place at 12% last year, to fourth this year at just under 10%. Dynamic Discs gained some ground, going from fourth last year with 6%, to second this year at nearly 12%. In third place, Latitude held steady at 10%. 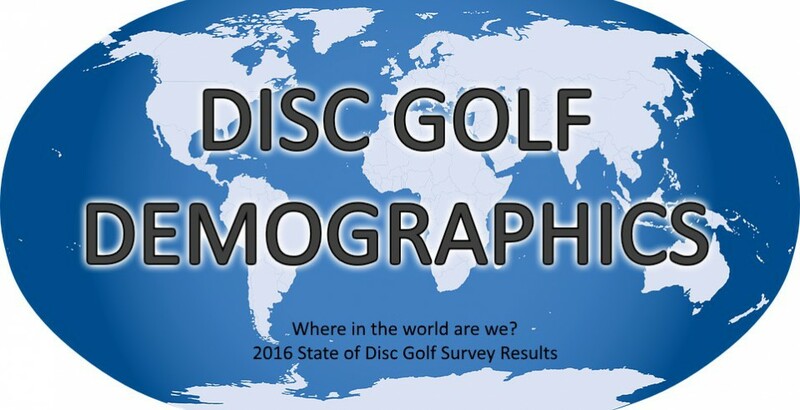 When taken as a whole, the three members of the Trilogy brand (Westside, Latitude 64, and Dynamic Discs) were the favorite of 26% of respondents. 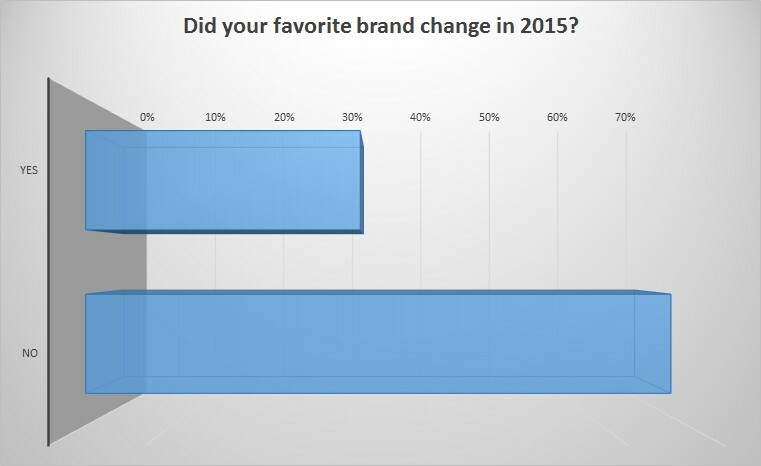 It is interesting to note that nearly a third of us changed our favorite brand from last year. With that much change, there is potential for some big swings in numbers. 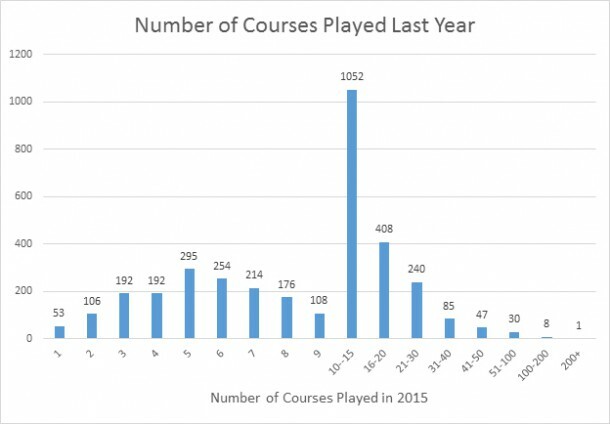 Yet, other than Dynamic Discs’ 6% increase, none of the changes were drastic. Although it is interesting to explore our favorite brands, there are other statistics in the survey that give a clearer picture of which brands are important to us. For example, the question “From which brand do you most look forward to new releases” showed a lot more even distribution of votes across manufacturers. 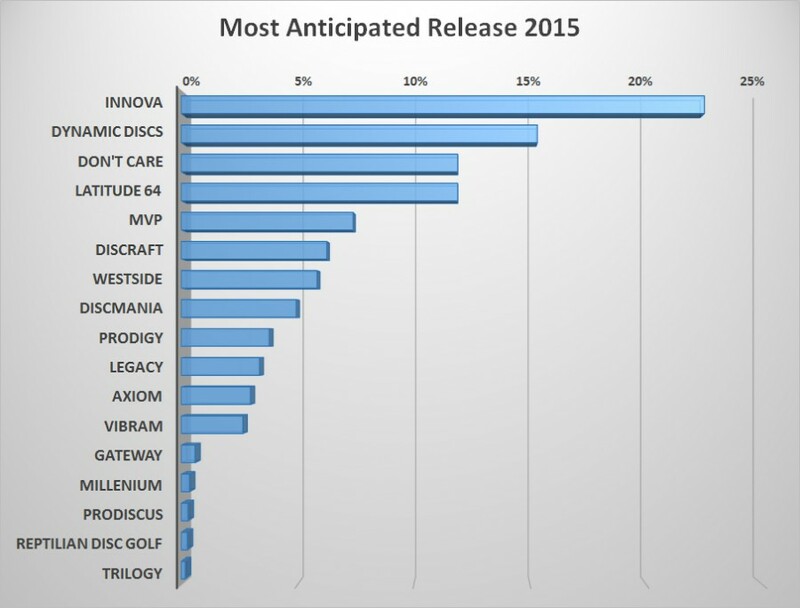 According to the survey, 22.5% of us look forward to new releases from Innova. They are still number one in this category, but that is nearly half the number of respondents that chose Innova as their favorite brand. The second-most anticipated release is from Dynamic Discs at 15.3%, and rounding out the top three is Latitude 64 with 11.9%. Incidentally, nearly 12% of us don’t really look forward to new releases. Is Innova going to lead every poll category? Nope. 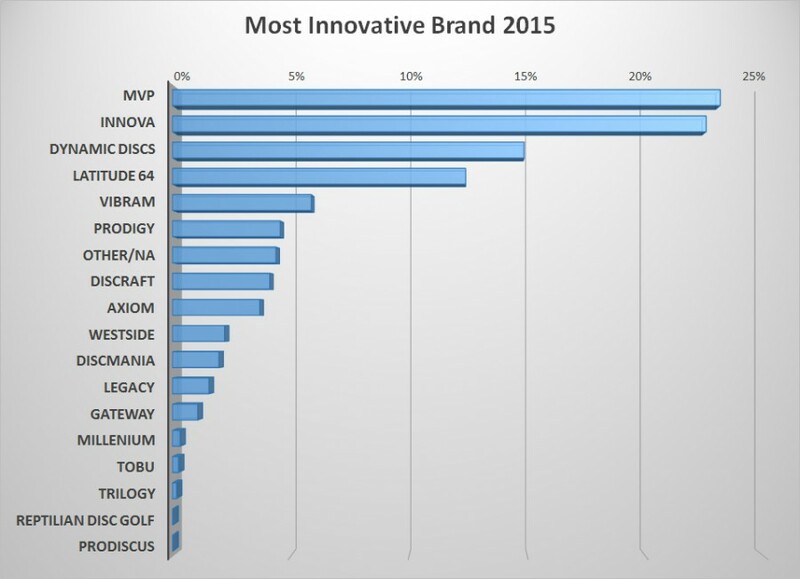 For the question, “Which brand is the most innovative?” MVP edged out Innova for the lead spot, 23.2% to 22.6%. 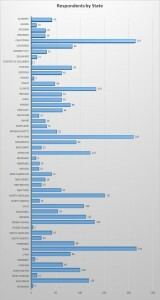 MVP gained in percentage about what Innova lost. The two companies have been trading positions for the last few years. The third and fourth positions were held by Dynamic Discs and Latitude 64. Innova isn’t just dominating nearly every poll category, they are garnering respect from more than their die-hard fans. 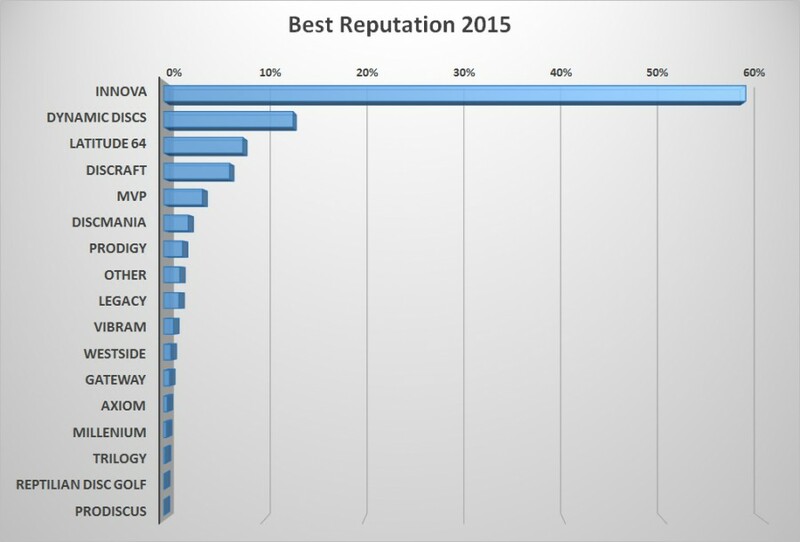 In the category asking which manufacturer has the best reputation, Innova took a huge lead over second place, getting 58.2% of the votes. The next closest was Dynamic at 12.9%. 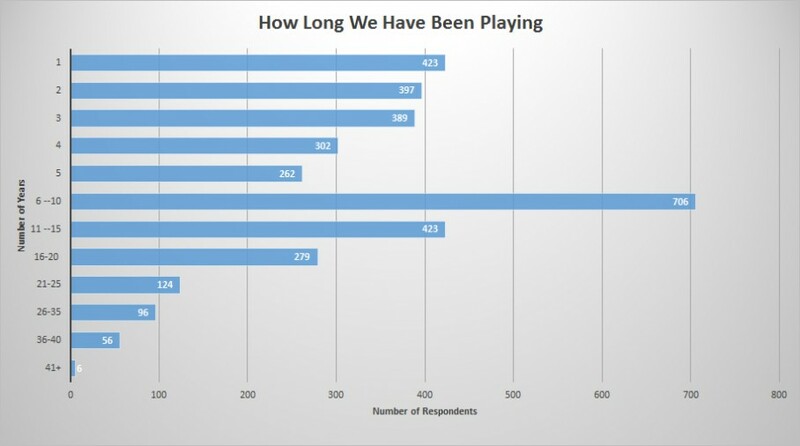 Perhaps people know how long Innova has been involved in the sport. Maybe it’s their sponsorship of so many events. Maybe it is the fact that they sponsor the four-time world champion, and other world-class disc golfers. It could even be their thorough selection of discs. This does not seem to be the type of category that would be inflated because of Innova’s wide and varied distribution channels. It just appears to be a nod to an old, established company. 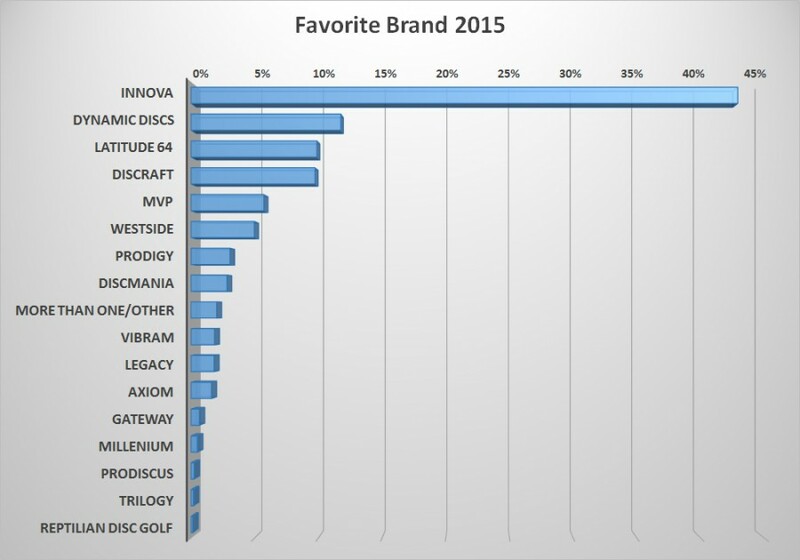 Whatever the reason, the number of respondents who voted for them far exceeds the number that chose Innova as their favorite brand. That’s pretty impressive. Similar to last year, about 6% of us have only one brand in our bags. Most of us are happy to throw discs from a variety of manufacturers, but these loyalist only throw a single brand. Innova aficionados make up 54% of the single-brand supporters. Discraft devotees come in second at 14%, and Prodigy proponents come in third with 8%. The survey didn’t ask for how many of each brand people had in their bags, so there could be a good percent of us who could be close to having a one-brand bag. However, most disc golfers love to experiment with brands, discs, and plastics (or rubber!). Now it’s time to turn away from how we feel about certain brands and turn to one of the most interesting and telling indicators of what manufacturers we like: what discs are in our bag. As I mentioned before, indicating which brand is our favorite, or which disc company is most revered, does not paint a clear picture of what we huck. So, let’s take a peek inside the bags of the thousands of people who responded. Spoiler alert: Innova won this category, too. It won’t come as a shock to anyone that most of us have at least one Innova disc in our bag. Again, they are one of the oldest manufacturers, host the widest selection of discs, can be found in a bigger variety of stores, etc. Over 83% of us are carrying around at least one Innova. That number is down ever so slightly from 86.8% last year. That is not a huge decrease, but it will be interesting to see what the future holds for the disc giant. 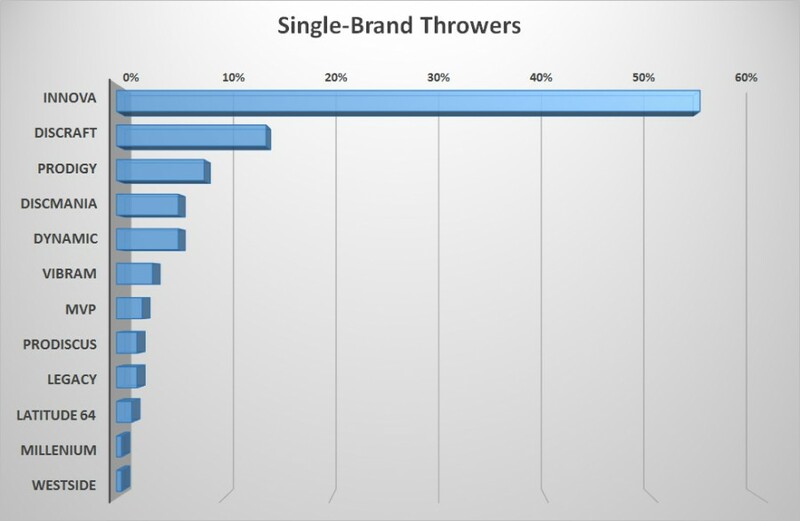 The second-most common disc manufacturer in our bags is Discraft, with 62.8% of us toting around the brand. 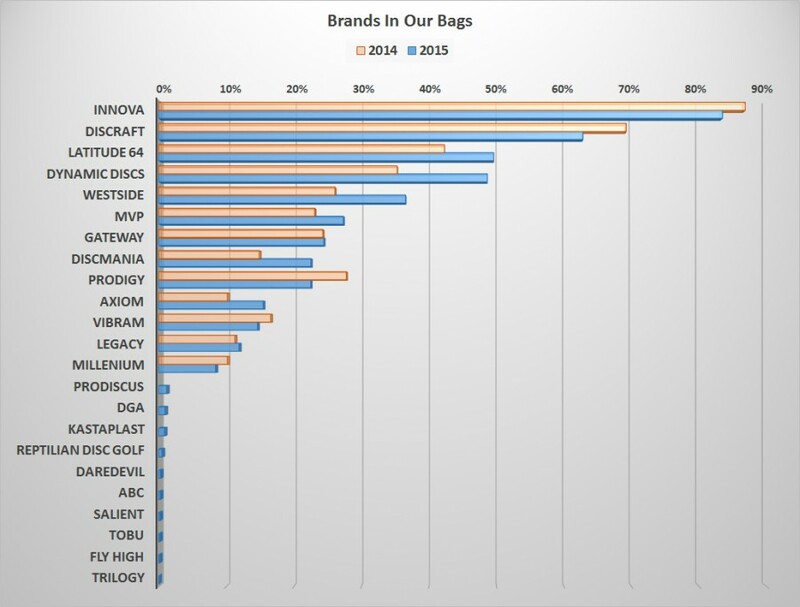 Last year 69.2% of us carried Discraft, which is a lot bigger year-to-year drop than Innova. Whose discs are poaching the bag space from these two giants? The members of the Trilogy are. Latitude 64, Dynamic Discs, and Westside, in that order. Latitude 64 went from 42.3% last year, to 49.6% this year. Dynamic Discs experienced a bigger gain, shooting from 35.3% to this year’s 48.6%. Westside also experienced a large increase in fans, moving from seventh place at 26.1% last year, to fifth place at 36.5 in this year’s survey. Becoming the discs that beginners start with. Most of us have a soft spot in our hearts for our first discs. I suspect they affected our buying habits for a long time. By actively introducing new players into the sport, manufacturers stand the chance of becoming their go-to brand. Find the plastic/mold that becomes popular. Okay, it is a lot more difficult to find the next hot model than just releasing a bunch of new discs. But, by continuing to experiment with new materials and molds, the chances of hitting a popular disc goes up. Sponsorship certainly helps keep their brand in people’s minds. Especially if you get lucky and sponsor a world champion. 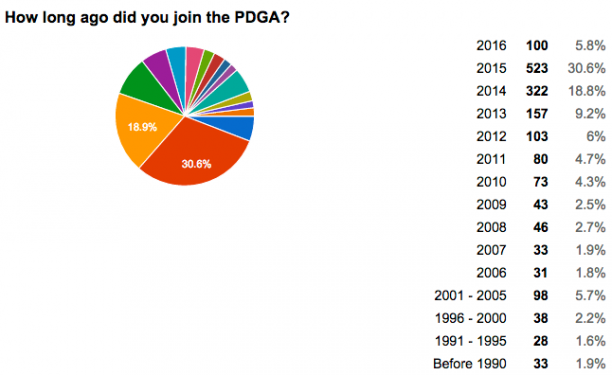 It is fun and interesting to look at how we view the companies in the disc golf world. Although we can only speculate as to what is driving some of the numbers, it is still interesting to look at data from the survey and see what is the most current snapshot of our preferences in brands. In the next few blogs we’ll continue to look at who we are and what we like. A practice basket is one of the best ways to keep your putting technique sharp. From time to time people ask which basket they should buy. In this blog post I will discuss four types of baskets and make recommendations for each one. The two things I ask before I recommend a basket to someone is how much they want to spend, and how the basket will be used. Specifically, how often will the basket be moved around, and will it be used for leagues or tournaments. Generally speaking, I would recommend the heavy-duty baskets for their quality and being the closest to duplicating the performance of a professional-level basket. If you are okay with the weight, bulk, and cost of the heavy baskets, that would be your best bet. However, if you will be transporting the basket a lot, you might not want to deal with the weight and bulk of the heavy-duty baskets. In that case, a light-duty or foldable basket will better suit your needs. Or, if you just want an inexpensive basket to practice with, you’ll be satisfied with the light-duty or foldable types. Infinite Discs asked a group of us to test all of the baskets mentioned above. After hundreds of putts on each one, from a variety of distances, we compiled our numbers and our opinions based on those numbers. The information below represents our results and views of the baskets. With that in mind, let’s examine the four types. This type of basket collapses down and fits inside a bag for ease of transport. They are great for practicing at home, and easiest to take elsewhere. They are comparable in price to the light-duty baskets. The Innova SkillShot has a smaller target area and because of that almost falls into the category of the ‘Narrow Target’ basket type. However, it catches discs much better than the other Narrow Target baskets and for that reason deserves to be in this category. Testing the SkillShot resulted in the most misses, which is not surprising given the smaller target area. The Traveler slightly edged the Mach Lite success rate, but not by much. Recommendation: The DGA Mach Lite is a quality basket that performs well, is easy to set up or down, and easy to transport. It is the most expensive of the three foldable baskets, but worth the extra money. If budget is more of a priority, you’ll be happy with one of the other two. If you can pay the little extra, it’s worth it for the performance of the Mach Lite. You are most likely considering this type of basket if you want to fine tune your putting. 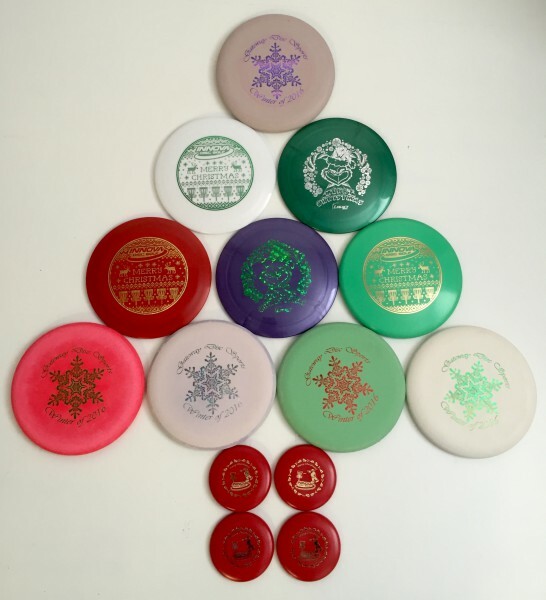 These don’t catch discs as well (it’s not their purpose) so you won’t haul it to a league or tournament very often. I have a Bullseye and like to use it to practice. It’s nice to train your brain to hit smaller targets. Since it is a smaller target, you will miss a lot more putts than on a regular basket. For that reason, I like to go back to my regular baskets after a bit. Even though you know a lot of those missed putts on a narrow basket would be successful on a bigger one, it’s nice to see a successful putt. I like to say that Narrow Target baskets are better as a second basket. Recommendation: Both of these baskets are built well and look good, but the Marksman costs quite a bit less. For that reason, I would recommend the Dynamic Discs Marksman. These baskets are slimmed down versions of the heavy baskets. They have fewer chains, and are lighter and less expensive. They aren’t as easy to fold up and move as the foldable type basket, but are easier than the heavy-duty baskets. Fewer and lighter chains mean more spit outs and misses, but not a significant amount less. These baskets cost $50-90 less than the heavier baskets, making them a good choice if you are on a budget. Recommendation: I would be happy to have any of these three in my backyard. While testing these baskets we had a slightly higher success rate with the Hive and Lite, but fewer spit outs with the Mach 14. Since it costs a little less, my recommendation is for the Discmania Lite. It’s the least expensive in its class, but performs similar to the other baskets. 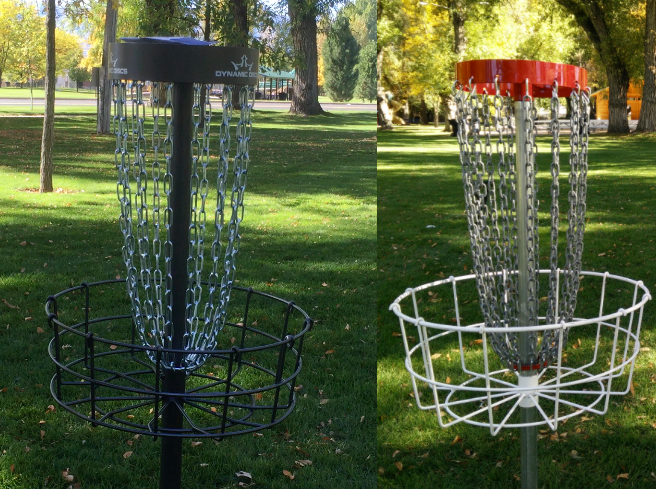 The closest to the professional baskets found at the disc golf course, these baskets are great for practicing at home or for playing extra holes at a tournament. Testing this type of basket led to the highest success rate and the least amount of spit outs. They are made well, with the higher price tag to go with them. 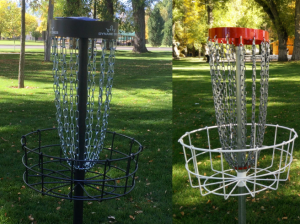 Recommendation: Although it costs more than all of the other baskets, the Dynamic Discs Recruit is worth the extra money. It looks good, performs well, and even has a wheel to make moving it a little easier. While testing it, we all liked the feeling of confidence we got while putting on the Recruit. Its large target area and band around the top gave us a great psychological boost. The basket looks and feels like a professional basket, while costing significantly less. Like the light-duty baskets, all three models are good. So, if the Recruit is out of your budget, you can spend a little less with one of the other two and still get a good basket.